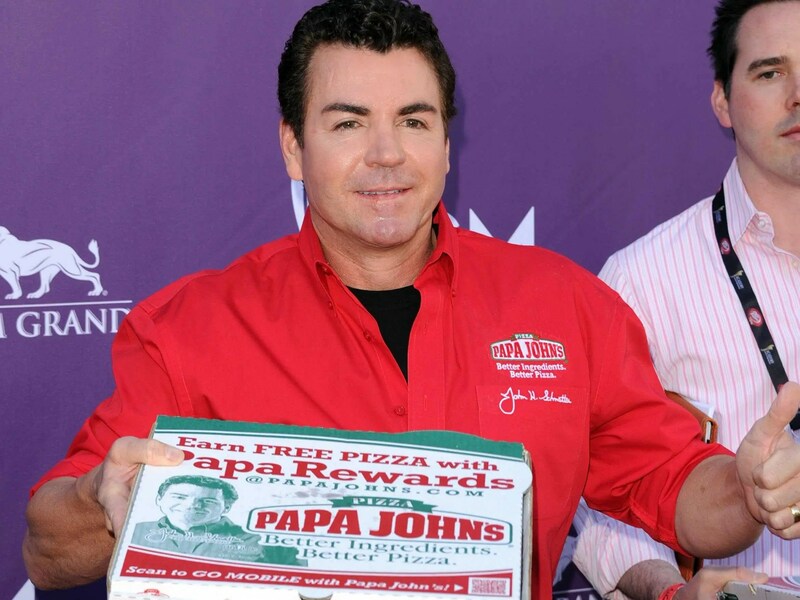 Papa John’s CEO’s net worth fell $70 million in one day. John Schnatter blamed NFL leadership and players’ national-anthem protests for the chain’s subpar sales in the most recent quarter. 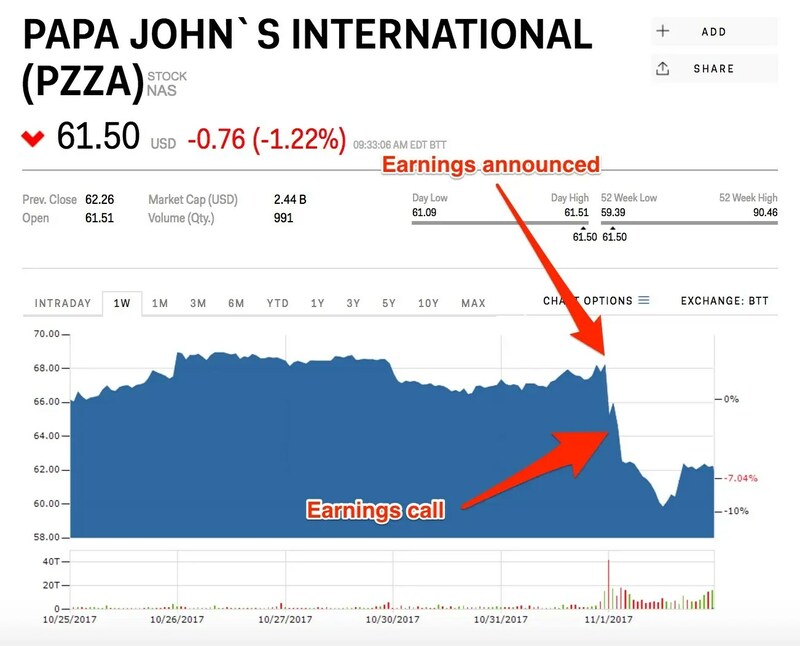 Papa John’s shares took a hit following his comments. The CEO and founder of Papa John’s saw his net worth drop by millions after the pizza chain reported worse-than-expected sales, which he blamed on the NFL. John Schnatter’s net worth dropped $70 million between Tuesday afternoon and Wednesday afternoon, Forbes reported. As of Wednesday, Schnatter was worth $801 million. Schnatter owns roughly 25% of Papa John’s — so when the company suffers, he is directly affected. Papa John’s shares plummeted after the company reported on Tuesday that same-store sales increased 1% in the most recent quarter, falling short of expectations. The company additionally lowered its forecast for North American same-store sales for the year to 1.5%, down from 2 to 4%. Shares fell further after the company’s earnings all on Wednesday morning, during which Schnatter blamed NFL leadership for failing to resolve the controversy over players protesting during the national anthem. The San Francisco 49ers quarterback Colin Kaepernick started kneeling during the anthem last year to protest racial injustice and police brutality. The controversy over the protests was renewed in September after President Donald Trump said players who did so should be fired. Papa John’s shares have since recovered somewhat, trading at $61.50 as of 10:05 a.m. on Thursday. It’s been NO secret that everyone on this planet uses us for their own personal gain. They despise us yet need us to make them rich and due to low self esteem, we comply, we buy, we brag about our 500.00 Jordan’s, all the while our communities have zero fresh vegetables, failing businesses and no black owned schools. This boycott should be the beginning of the END for non black companies. From the Asian beauty supply stores that speak badly about us in front of us in Cantonese, to the East Indians who sell our children poison meat and stale milk, to the Arab who openly calls us niggers then demand that we buy their newspapers and their gas, let them ALL fail. The one great thing about Trump being in office is how brazen they have all become in their hate for us while thinking we’ll still support them! We are 50% to blame for this thinking as we suffer from Stockholm Syndrome and many of us are too far gone to stop now. But for those of us that are awake, vibrant, clever, ever-thinking and ready for stealth combat, let this season be the one that shows our open enemy that we’re done playing the economic game with them. Let’s simply turn our backs on them without saying a word and watch them slowly go out of business. Please pass along this post and begin today. A great start is to boycott Michael Jordan’s sneakers and clothing line. This black male has stocks in the prison industrial system. Did you notice that Papa John’s ( a fake JOO ) uniform is the Freemasonic colours of Red and Black? Bartering is as old as time. A few tomato seeds for a pail of fresh water. What if we could cut out the middleman and trade DIRECTLY with each other? Blacks in America are the largest consumers of all the racial groups combined. We buy EVERYTHING from someone else but make very little ourselves. After the prosperity of Black Wall Street, which was intentionally destroyed, the United States government devised a very diabolical plan. The black dollar must leave our wallets every 15 minutes. Soon, other immigrant races were given stipends and free grants to open up shop in our neighbourhoods. Cheap plastic goods, stale and rotted meats, liquor and tobacco stores, check cashing places and slum lords were made rich off of our despair. Our black owned farms that offered us fresh, wholesome foods went belly up due to soaring government taxes. They were then taken over by whites at cheaper prices so they could provide the white community with organic nutritious meals. Today, in 2015, absolutely NOTHING has changed. We may not wish to hear this but we are to be partially blamed for our dire predicament. Because we have the power to change things but lack the will. What is African Bartering Community? A.B.C. is a worldwide, black organization designed to cut out the monetary middleman and barter (trade) strictly with other blacks for goods. 2. How does A.B.C. work? A.B.C. works quite simply. A group of willing blacks must coordinate a gathering, like someone’s backyard, a flea market, a church social, etc, where goods are exchanged without money. Value must be determined individually and once agreed upon, a loving and equal exchange must take place. Example #1: I need a pick up truck. My black neighbour needs a riding lawn mower. We swap goods without the use of money and shake hands to finalize the deal. 3. Why is this a good practice? Isn’t money always needed? Blacks are, unfortunately, the largest group of consumers in America. We buy more than what we really need to survive and purchase those goods from other races. By cutting out the middleman, we SAVE money for other things and build much-needed TRUST within our people. Did you know that there are groups of people living within the U.S. that operate mostly (as much as possible) without the use of money for goods? My own next door neighbour swaps root vegetables for firewood and has been doing that for many years with SUCCESS! He trades with other whites in our farming community. The only people who are intentionally left out of this practice are the few black families that live here. Money has always been around in some form, like cowry shells, since the beginning but it is possible to LESSEN our infatuation with money. Yes, I said infatuation. BLACK PEOPLE LOVE MONEY. And we love having lots of stuff. The more stuff we acquire, the greater sense of self worth we falsely obtain. By lessening our dependence on the monetary middleman, we take back our power and our dignity. We build stronger communities based on trust, which we lack. We begin to rely on each other once again for survival thus making us stronger as a unified group. 4. How do I join and why should I? When George Zimmerman killed Trayvon Martin and we learned that Skittles funded his lawyer, that was a perfect opportunity for us to show our power and our self love by refraining from buying Skittles candies. The door swings both ways. We can refrain from supporting racist organizations simply by NOT giving them our money. We can take back our pride by simply refusing to cooperate with any company that we feel is degrading to our people…worldwide. When Tommy Hilfiger stated that he “didn’t make his clothes for black people” that was our opportunity to cut him out of the black community FOREVER and give our support to the struggling black clothing companies around the globe. Instead we got angry and insisted that we had the right to wear his clothing. Tommy became richer and more famous (or infamous) and the black dollar left our pockets. We are so desperate to be loved we do not care even if it’s from someone who hates us. Joining A.B.C. takes a few things that the black community must work on for we are weak in these areas. The first thing is organization. Again, places can include someone’s yard, their basement or an open flea market. Exchange phone numbers and emails to the person you wish to trade with. Decide what you’ll be trading and remember that once the trade has taken place it is FINAL and no negative feelings are to be shown. You are trying to re-build trust and love, not start a fight or argument. Finally, there’s much discussion about the wave of immigrants, especially Coloured immigrants, coming to America and opening stores in our neighbourhoods. You know why they are doing well? Because we give them our money! They are simply doing what whites have done for centuries; taking advantage of the most oppressed race and making money (exploiting) off of them. I’ve been saying for years that black people’s need to be loved and included by anyone who sorta-kinda looks like us will be our downfall. The other races have consistently demonstrated that they don’t give a damn about us and are happy that we are sliding further and further down the economic ladder. That gives them more opportunity to get closer to their colonial masters. They use us as a stepping stone for economic stability and benefit from our fight for equal rights to better themselves. Then when they “make it”, they spit in our faces. For we are a hard-headed, disgruntled, disoriented, intra-competitive and envious group bent set on inclusion. The time has come for us to stop trying to “hold hands” with the browish-tanish-yellowish-golden “others” and begin doing for self. No one can make us do better. It must come from desire within oneself. Please pass on this post to others and begin your own African Bartering Community. Start today. Call your neighbour/ friend/ cousin and begin conversing. You might find out that they’ve been wanting to do the same thing but didn’t know how to begin! Since the holiday season is upon us, I’ll do a post on black owned businesses for those that wish to support the black community with monetary means.